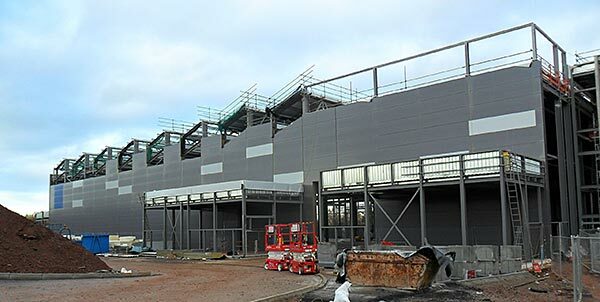 A multi million pound extension to the National Composites Centre (NCC) in Bristol is nearing completion due to steelwork’s ease and speed of construction. Phase one of the project opened in 2011 and due to its success a 11,500m² second phase was quickly decided on by the project’s owner the University of Bristol. Costing £25m, Phase 2 consists of a three-storey knowledge and innovation block and a single storey manufacturing and demonstration building. Both buildings are steel framed and are scheduled for a completion date in June. Paul Hayes, Billington Structures Project Manager said: “What makes the innovation block interesting is that for similar spans, there are varying beam sizes. This is because the university specified very different loading criteria for all the different areas. The NCC provides manufacturing facilities at an industrial scale for the testing of a wide of range of prototypes. The site also brings together academics and companies in order to develop new technologies for the design and manufacture of composite products.